For the past ten years, I've been documenting and interpreting the Christmas decorations on Bob Dylan's Malibu home, much as the hippest music critics of my youth dwelled on and picked apart the abstract lyrics of his songs. My reasons were many and you can read about them in this early analysis, here. I honestly didn’t think I would be able to file a report this year because, well, on November 9, Malibu (where Mr. Dylan and I both have homes) caught fire. The residents who were not on tour, like me, had to evacuate until almost the first of December. While Mr. Dylan and I were both miraculously spared, he suffered a notable loss. The legendary hedge that in years past housed his annual lighting display, along with the wooden fence on which it rested, burned down. Given the sobriety of this setting, it was impossible to guess if there would be any attempt at exterior holiday décor this year. But by mid December, something miraculous appeared behind the newly deforested cyclone fence that was apparently always behind the other fence. There, between two never-before-seen plaster angels, sat a brightly colored inflatable manger scene! I gasped. It was every bit as radical a departure for Bob as his most legendary one in 1965 at The Newport Folk Festival when he caused such an uproar because he “went electric." Over the years I had come to rely on the impressive continuity of his seasonal panorama; always steady and constant while at the same time imbued with a wide variety of distinctive subtextual messages. In 2010, pictured above, it was an urgent dispatch in lights about unemployment. In 2011, the lights themselves formed a sophisticated atonal lament. 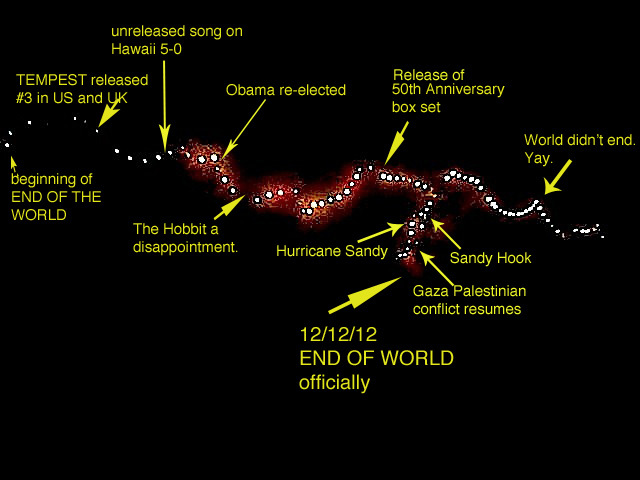 In 2012, his diverse topical concerns played out against the widely discussed and looming prediction of the Mayan apocalypse. And on and on, as you can see here and here and here. Year after year, his annual dispatch in lights was comforting in its consistency while remaining surprising. Not unlike his songs. And then this year, hot on the heels of a cataclysmic disaster, an entirely different approach had been born. Quickly I set about deciphering the new message he was obviously sending by juxtaposing two common plaster and resin garden angel statues with an inflated waterproof nylon TCP Global Christmas Master’s-brand crèche depicting the Blessed Birth of The King of Kings. Was the Nobel Laureate trying to tell us that renewed spiritual values and our very salvation were as simple as a quick trip to Home Depot? Or was he perhaps saying that all too often 21st century spirituality had become disposable, cloying and full of hot air? Could this be a dispatch pointing out that even the baby Jesus himself had become, at this point in our culture, no better regarded than any other poorly rendered cartoon character we might find in some hastily produced stop-action special about Frosty the Snowman? Intrigued by these challenging questions, I retired to my home to address them. But when I returned for a second viewing, I again found myself gasping out loud. Because there, in the very spot where once the Holy Family sat inflated and bathed in LED... THERE WAS NOTHING AT ALL. It was gone, literally and figuratively. A Christmas mystery! Where did it go? What happened? Had there been yet another change of heart? Was Bob once again confounding all of our expectations by making a Buddhist statement about the transitory nature of all things? Or was it possible that even so legendary a figure as Bob had been seduced by an irresistible inflatable decoration he’d hastily acquired before ever checking its ghastly reviews on Amazon Prime? With no immediate answer on the horizon, I had barely a chance to mourn its all-too-quick passing when yet another holiday miracle occurred—a brand new, far more carefully arranged, entirely different yet shockingly more traditional lighting display was unveiled for 2018 in the very same spot where once stood the magnificent hedge of yore. All I could say was "Wow." What an unexpected turn of events! After a full decade of seemingly improvisational, almost haphazard looking lighting tableaus, here now was a design as fluid with symmetry as it was conversant in the language of negative space. The new arrangement was breathtakingly classical in its Hellenic formality while at the same time taking a giant step forward into the unknown. Who could have predicted that the terrifying fires that had almost destroyed Malibu would have somehow reduced everything for Bob to their most fundamental decorative lines and shapes? And in so doing, allowed him to now reach out to a whole new audience that might have resisted the more erratically arranged lights of yesteryear? Unsurprisingly, what these new lights had to say was as crucial an annual message as any that had come before. More importantly Bob’s lighting message of 2018 turned out to be as profound as the one sent by John Lennon’s first solo album when he confounded all expectations by a return to a simpler, more basic approach. With this new, more classically arranged format, Bob is reminding us that the true spirit of Christmas right now can best be found in a return, for our country, to the classic values of democracy to which it used to aspire. He is telling us that it is time, once again, to welcome the disenfranchised, make protecting the environment a priority, re-instate the traditions of intelligent civil discourse, revive the two party system of debate, begin in earnest to fight against gun violence, and for the protection of all of our rights, regardless of gender, race, or ethnic heritage. And yes... re-commit to the ideals of democracy for all. Only Bob Dylan could say so much with a simple string of lights. Happy Holidays.